I have a soft spot for the Tampa Bay Buccaneers. Why? Because back in 2008, when my beloved Detroit Lions were losing every game in that 16-game season, I could point to the Tampa Bay Bucs (who, before the Lions, held the record for most games lost in a season). So it's pretty cool that the Bucs are moving into the 21st century by purchasing iPad 2 tablets for all of their players. 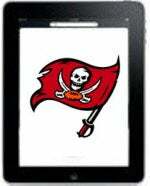 According to the St. Petersburg Times, the Bucs have downloaded their playbooks onto 90 iPad 2s -- one for each of their 90 players. Coach Raheem Morris came up with the iPad idea, after using an iPad to watch a video of one of the draft prospects. The players will not only be able to access playbooks on the tablets, they can also watch videos of games, practice, and other teams. "It's crazy how much technology has changed the game," Bucs Safety Cody Grimm told the Times. "Back in the day, I think probably the whole team had to sit down with a projector and a reel, and watch the film together. They'd have the whole offense in the same meeting room. Now we all have our own iPad. Stuff that we used to come in here to see, we can sit on our couch at home and have access to it 24-7. It's awesome." This isn't the first we've heard of iPads replacing playbooks--back in February, the Dallas Cowboys considered giving its players iPads as playbook replacements. Plus, the younger guys on the team (the Bucs have more young players than almost any other team in the league) are all about having the latest Apple technology in their hands. The Times points out that the new technology will probably be an incentive for players to study plays and games. "That's big ups to our organization thinking like that because it is the biggest thing right now and we have a big crowd," Bucs Linebacker Geno Hayes told the Times. The new iPad initiative will also be good for team security. "We give these playbooks out, and by the end of training camp, we collect them so nobody sells them on the Internet," Morris told the Times. Plus, if someone loses a "playbook," or iPad, it's actually better than leaving behind a physical playbook--"You've got a way to wipe (everything) off with the push of a button," Morris said.